As part of the campus St. Scholastica Feast Day celebrations, members of the College community are invited to attend a panel discussion featuring three alumni reflecting on the Benedictine Values. The discussion will take place from noon to 1:40 p.m. on Tuesday, Feb. 13 in the Mitchell Auditorium. 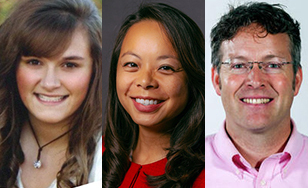 Panelists will include Krystal Hoheisel, Diane Tran and Joe Wicklund. Krystal Hoheisel graduated in 2015 with a BA in marketing/marketing analytics and served as student body president during her time here. She's currently a member of the St. Scholastica Alumni Board and is in search of a marketing position in the Twin Cities. She has previously worked in social media at Visit Duluth and maurices. Diane Tran is System Director of Neighborhood Integration at HealthEast Care System, the largest healthcare provider in the Twin Cities' East Metro area. Diane earned a self-designed bachelor's degree in International Social Policy with a double major in Humanities. Diane is the founder of Minnesota Rising, a statewide network of emerging leaders working to build relationships, trust, and a shared vision for the state, and developing the collective capacity of the rising generation to impact Minnesota's future. Joe Wicklund is the Director of Enrollment management at Marshall School. He earned a bachelor's degree in communication/journalism and master's degrees in business administration and management from St. Scholastica. He serves on the board of directors for Grandma's Marathon and John Baggs Foundation, and is a baseball coach for American Legion Post 71-West Duluth, at Marshall School and for VFW Post 173-Marshall School. Feast Day celebrations begin on Monday, Feb. 12 with free donuts and juice, provided by St. Scholastica Monastery Sisters, from 7:30 a.m. to 9 a.m. in the Student Union, Benedictine Commons, and the Health Science Center. The College will provide an Italian buffet lunch from 11 a.m. to 1 p.m. in the Greenview Dining Room. Lastly, join the Sisters for a Celebration of the Eucharist at 4:30 p.m. in Our Lady Queen of Peace Chapel.